However, creating an OTT offering is easier said than done. Unlike traditional broadcast, the delivery and monetization models for OTT are diverse and continuously evolving. Traditional TV networks have long been using legacy playout systems with standardized workflows and processes created by a trained workforce that is aligned to those processes. By contrast, when it comes to emerging technologies like OTT, TV networks could face a shortage of skills that would make it difficult to align with the dynamic nature of OTT. When designing an OTT channel, broadcasters must pay careful attention to multiple components and subcomponents of OTT playout and delivery. For starters, TV Networks must decide whether to deliver the content themselves, perhaps through a custom app, or through aggregators such as Amazon Prime, Sling TV, Netflix, and YuppTV. Next, they must choose a streaming format from multiple options - HLS, RTMP, MPEG-DASH, and many others. Another important factor to consider is the geographical location of the audience, as it determines the CDN strategy. Does the situation call for using a single CDN or more than one? For example, Level 3 Communications is an excellent choice for delivery in the USA, while Akamai might be better for global delivery due to its wider coverage. A third, more cost-effective alternative would be to use a service such as Hola, which acts as an intermediate layer between multiple CDNs. All three of those options are essentially managed services, but TV networks have yet another option: deliver OTT channels through a self-service CDN platform such as Amazon CloudFront. Obviously the approach a broadcaster chooses will have a direct effect on costs. Finally, when it comes to ad monetization, there are multiple decisions to make at this stage as well. Should you implement an ad-free subscription model or ad-supported model? What's the best approach to ad insertion, client-side or server-side? Making the right decision at each step requires expert help, and even then, it can be taxing to coordinate with multiple vendors. What's needed is a single-vendor solution to stitch together all the disparate components of the process. Cloud-based playout solutions and services are the best way to meet the end-to-end OTT channel delivery and monetization requirements of TV networks. These cloud-native solutions enable TV networks to create OTT and VOD programming using content they already have. Content can be ingested from various sources (such as mobile phones, Facebook Live, or professional live recording services), processed on the cloud, and then delivered to various data centers or CDNs in the required format. In short, working with a single cloud-playout vendor can surmount multiple decision-making hurdles for the TV networks when it comes to launching an OTT channel. Besides being able to simplify OTT channel development and maximize use of existing assets, traditional TV networks can gain numerous other business benefits from a single-vendor cloud approach to OTT delivery and monetization. 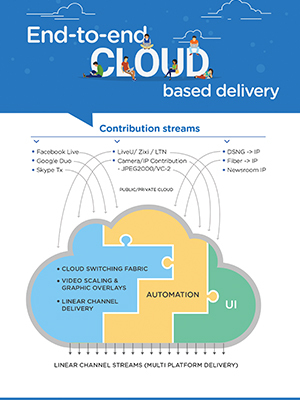 To begin with, through the cloud-based broadcast model, networks can make the same asset available for multiple streams, customized by content and delivery format, which vastly improves the scalability of the channel. Cloud also makes it possible to store and archive content safely, with anytime access, so networks can manage their OTT channels dynamically. A dynamic, flexible, and scalable cloud-driven infrastructure means broadcasters no longer need long-term fixed business plans and investment cycles. Instead they can quickly respond to changing market dynamics and create new channels in less than a week! In terms of monetization, cloud-based OTT broadcast solutions can reduce the risks associated with choosing a monetization method, due to familiarity with the best practices in OTT industry. For instance, server-side OTT ad insertion is quickly gaining momentum due to assured ad views and a better experience for the viewers. Any TV network that is planning a transition to OTT would do well to consider a vendor who can not only stitch together OTT playout and delivery to the appropriate CDN, but can also help bolster monetization by integrating ad exchanges with server-side ad-insertion platforms. As millennials and the "cord-nevers" become the most sought-after audience group, OTT will gradually replace traditional broadcast models as the main source of information and entertainment. To expand viewership and successfully transition to this new age of broadcast, TV networks must initiate and execute their OTT strategies now. To that end, choosing a qualified end-to-end OTT solution vendor is the crucial first step in launching and monetizing OTT channels successfully.